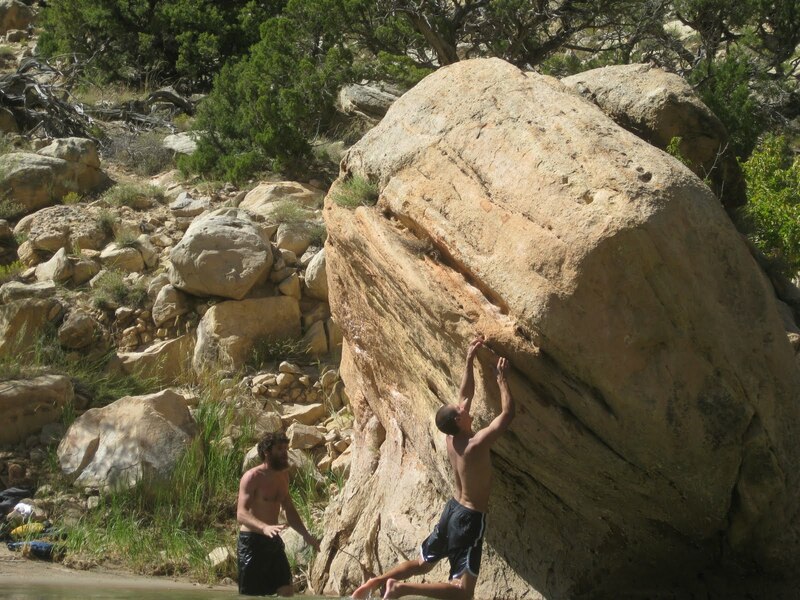 Some shallow water bouldering! Jason tearing it up. Jason and Nelson getting ready to tango on the sandbar. Me aiding the first pitch. Carrying some gear from the boat to the route. 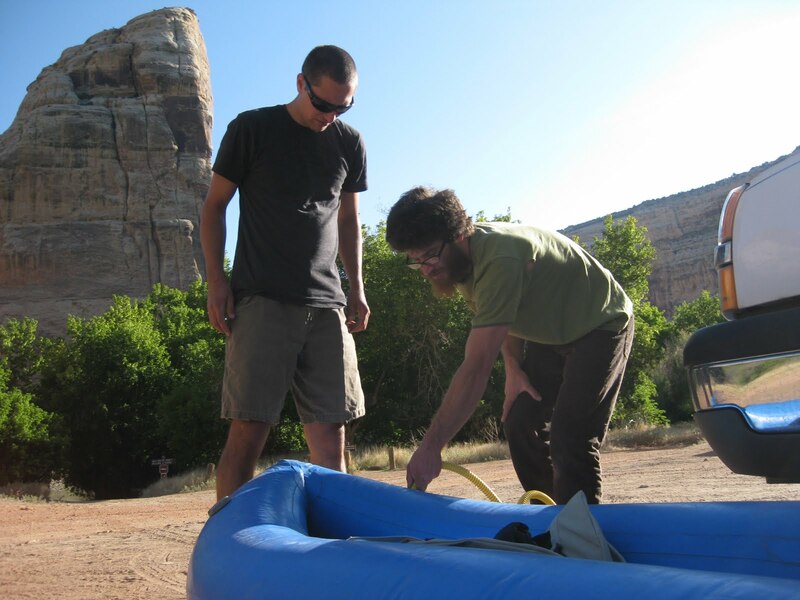 Nelson and Jason filling up the kayak, with Steamboat rock in the background. 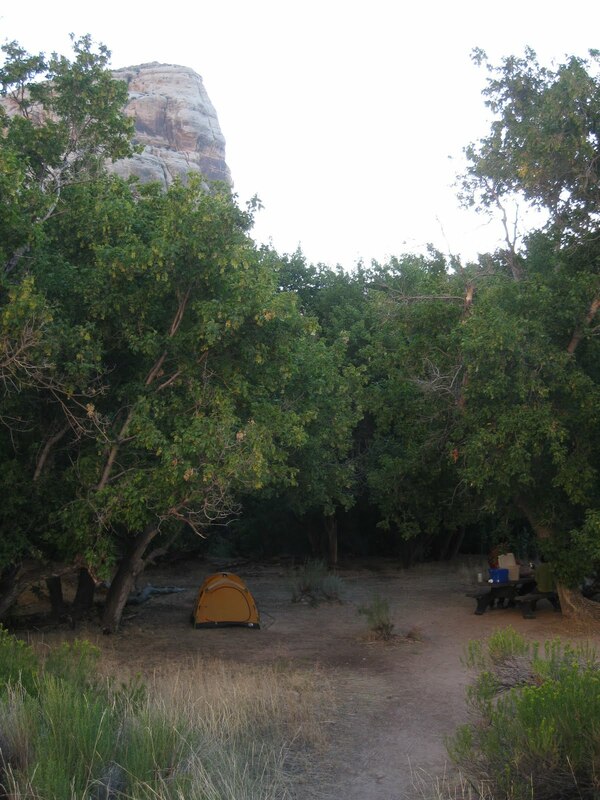 Our tent site along the river. Well this weekend was a busy one that wore me out! It began with driving nearly 7 hours after work to the upper left hand corner of Colorado to a place called Dinosaur National Monument. We were heading to Steamboat Rock which lies at the confluence of the Yampa and Green rivers and stands a few hundred foot tall. Layton Kor climbed the plum line up the sandstone wall and I was out to free the first aid pitch (hope to free at least). I traveled with Nelson and Jason, both of whom were up for an adventure. One of the difficulties was the fact that we had to cross the river without getting our gear wet, so we borrowed an infaltable kayak and paddled across. Since none of us are very expereinced on the river it was nice to see that all the water was flat and there were no rapids downstream to wreck our day. So we arrived late at night and slept in a traquil site along the river under some huge trees. There was a light breeze and thousands of stars in view. As we faded into our slumber, it was easy to count the shooting stars burning up in the atmosphere above because every August is a great time to see space junk getting caught in Earth’s gravity. 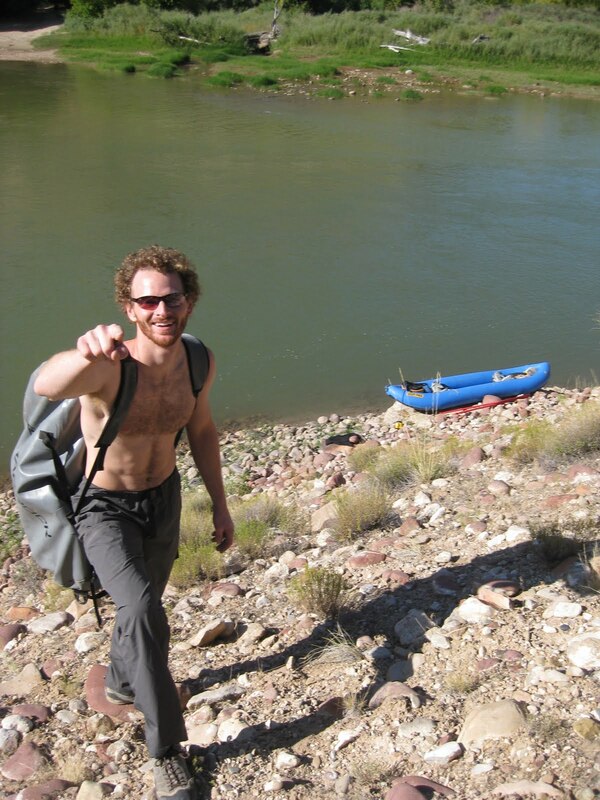 In the morning, we filled up the boat and crossed the easy flowing 200 ft wide river. Jason and I crossed with the gear and I went back to get Nelson and the camera gear. 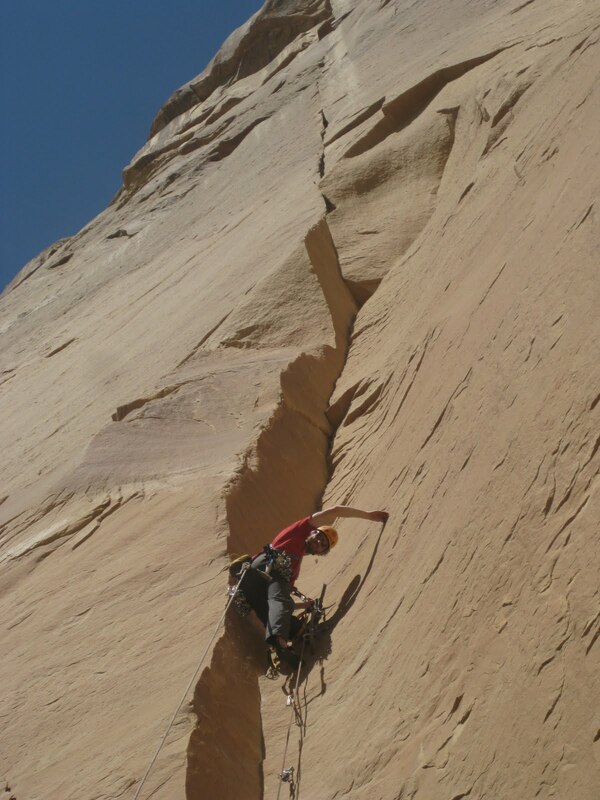 On this climb I began aiding up the thin and sometimes nonexistant crack with my rock hammer, pins and knife blades. Each placement getting me a bit higher on the route. It was the first time that I had ever led a hammering pitch and it was kinda cool. I eventually reached the top of the pitch and set a top rope in order to practice the free movements of the route. Unfortunately, Jason and I had good success at the bottom of the pitch, but found that there was not enough features in the sandy dihedral to free climb to the top. I knew that there was a chance that the route would be impossible and I hoped that it wouldn’t be but not ever climbing trip is perfect. 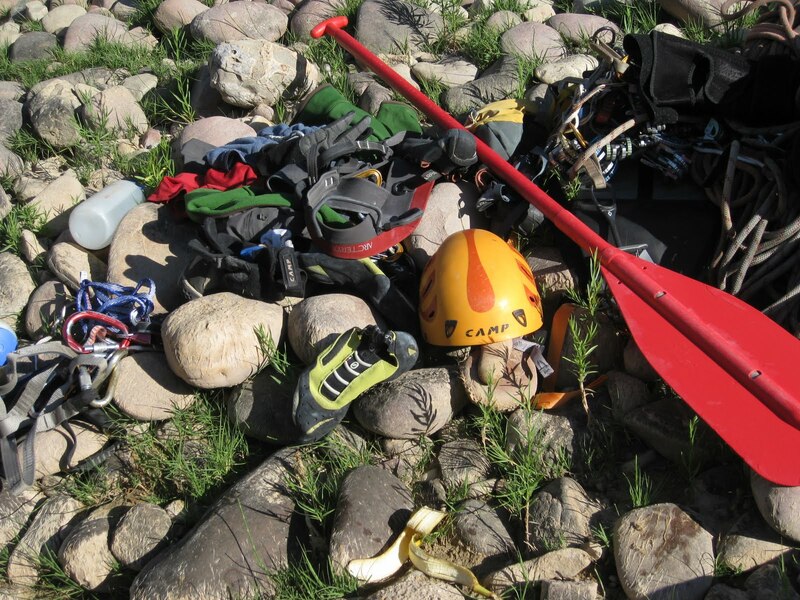 It was successful in that I learned how to keep gear dry on the river and perform river crossings and that I enjoyed the experience. 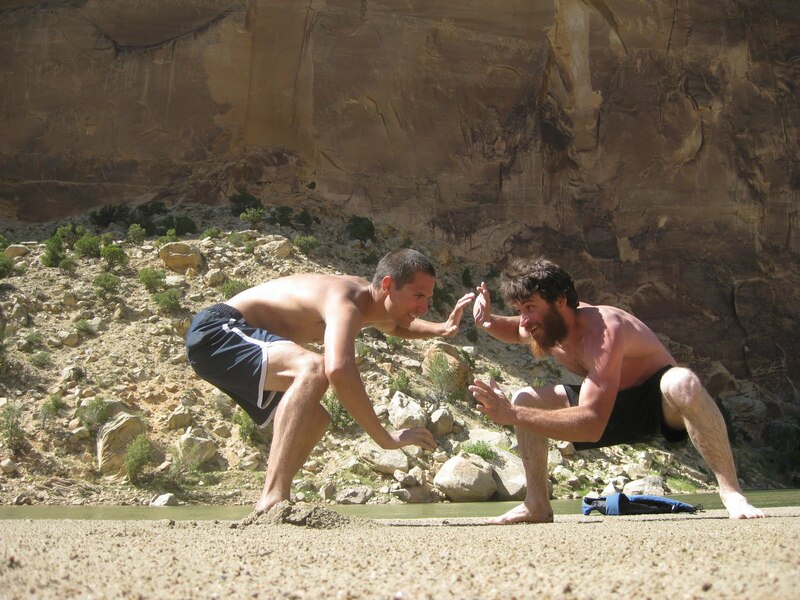 I look forward to my next river/climbing trip in September in Utah. After we retreived our gear from the route it was time to swim and have some fun in the river because we were getting crushed by the heat of the sun.